A practical text covering the theory and the practice of clinical reasoning skills for all physical therapists. Provides readers with activities to improve their own clinical reasoning within their own clinical setting. 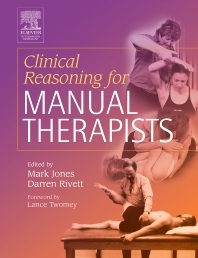 With a range of very high-caliber international contributors in the field of physiotherapy practice, this book gives the answers to the practitioner's question of how does one apply the theoretical knowledge involved in clinical reasoning to practice and how can one become a better practitioner as a result.